UFC returned to the UK last night for UFC 89 at the National Indoor Arena, Birmingham. 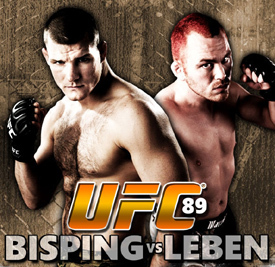 Our very own Michael ‘the count’ Bisping was fighting at 185 pounds against Chris ‘the crippler’ Leben. Both shot to fame in different series of The Ultimate Fighter Reality TV show. Chris is known for his heavy hands and rock solid chin. Click below for a summary on the fights (including results). Bisping executed his plan to perfection, taking a unamimous points win over Leben. Counter punching with good body kicks thrown in, Bisping inflicted all the damage on Leben. At the end of the fight Chris was cut and bruised yet Michael was as fresh as a daisy. Excellent demonstration of footwork for the count, before taking a Unanimous Decision. Really disappointed with this fight, technically Vera is the beter fighter, both standing, in the clinch and with his awesome (and under-rated) ground game. Jardine, with his awkward drunk / lost style took a split decision. Sokoudjou, nicknamed the African Assasin, cam out strong with bigggg kicks and punches. However you could see he was getting slightly frustrated as the fight wore on when things did not go his way. Eventually tiredness got the better of him, towards the end of the first round and Cane came back into the fight. He was always pressing forward but started to find his range. Just into the second round Cane caught Soko with a good leg kick and followed it up with a few punches, taking Soko to the floor. A flurry of unanswered ground and pound and the fight was stopped. WOW, the first minute sums up this fight, all action, easily fight of the night. At the weighin they told everyone this would happen, and oh yes it did. Pretty much 50/50 all the way in terms of standup, with Taylor throwing more counter punches. Lytle’s experience told though, using the extra body strength to turn Paul into the cage at will. Paul could have took the win with a knockout in the last round when Chris was gassed, but his punches lacked precision and Chris held on for the Unanimous Decision. Fight played out pretty much as expected, both guys standing as their strongest points, but Marcus, the ‘irish hand grenade’ having a huge advantage on the ground, eventually working a guillotine choke in the second round.